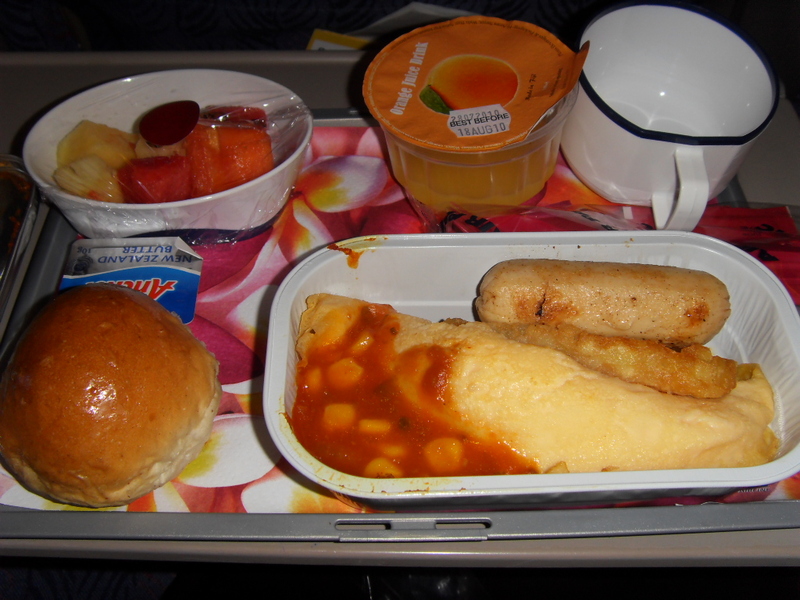 Aeroplane Food – Love it! Hate it! Throw it away! Cattle Class stand up and be counted! 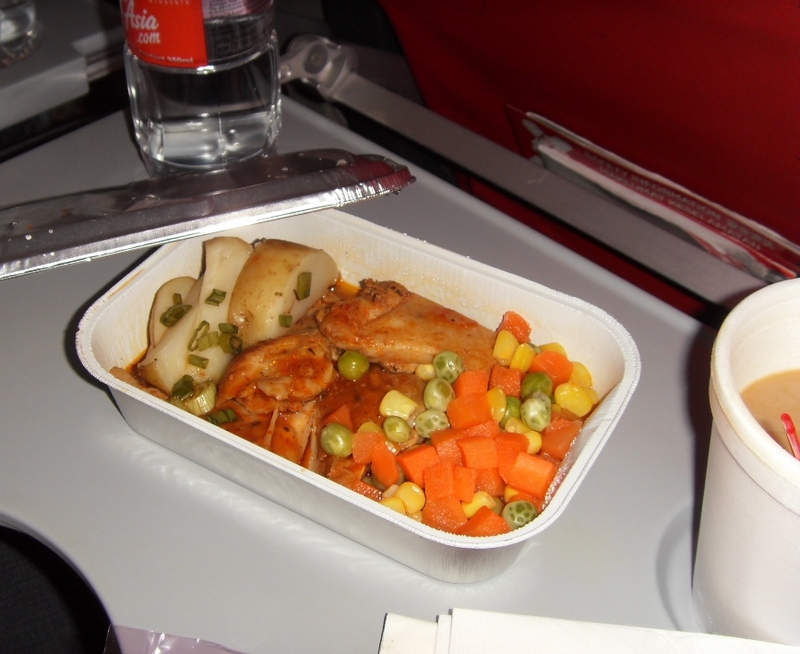 What is it with Airline food? I read an article in The Star a couple of weeks ago saying this airline and that airline including MAS for that matter was improving its food and cooking a la minute and all that jazz, Of course this only happens in First Class and Business Class and we in cattle class seldom see it happening at all. Since I started this blog, I have been a little bit more watchful and discerning about food. Although I used to see and shake my head, but now armed with my little Samsung i8, I take photos of these cuisines of dismay. Dan had a meal on Air Asia when we flew to Melbourne, I booked his tickets and got him his food knowing full well he gets hungry quite easily, and while the photo online looked “pretty awesome” , but when he opened the cover. Low and behold! There lay in the container, two pieces of rather dead looking chicken parts, and potatoes which looked fine and frozen mixed vegetables and the garnish was spring onions. Now food presentation wise.. that was a big ZERO! The chef concerned should realize anything light green is not going to look appetizing after a few hours. In fact even an hour later greens don’t look nice at all. Why do they choose to use something that will look unappetizing? Have they themselves checked to see the appearance after a few hours? Do they know? Would the CEO of Air Asia and the other big wigs of Air Asia eat it? As a caterer, I always make sure I do vegetables that will look like vegetables after a few hours of cooking. It is necessary and if my customer insists, I will warn them so that they will know what is going to happen. I think Air Asia although a budget airline should serve good food and food that can take them a plateau higher then their competition. And since they outsource, they should ensure food is better quality and at least the appearance should be appealing. I have seen their chicken rice and nasi lemak as well and it was just absolutely shocking. I wish I took photos. Where is the pride? You may be selling tickets at a good budget price so why not sell good or even better food? Foods should be servable a few hours after it is cooked and packed and still look nice after it is microwaved. Steaming nasi lemak with steamed Anchovies and Peanuts and not to mention cucumber. Why serve something that’s an institution in this country in that manner. It is a food mockery! What next? Steamed Satay? Does anyone out there realize you serve Malaysian Food at its worst, foreign travelers will never touch the same food again when they have landed. Why serve foods that are the very institution of this country? Is it necessary? For our Fiji Trip the food was different. No doubts it was not a budget airline, but still I think the fact that they did not try to feed us typical Fijian food was a good thing. Why because someone up there knew it was not a good idea, for one, the appearance would have been a put off, the taste would have been out, and we as tourists would have such a bad perception of Fijian food we would never eat it again. We were served chicken with a brown sauce and mashed potatoes and string beans which are dark in color before being cooked and so once cooked it does not look so off putting and sliced carrots. None of this rubbish frozen mixed vegetables. We had a bread roll with butter, a piece of carrot cake and a bottle of water. I have to say the bread in the cup was a bit off. I think they should have passed it out to passengers and made it more personal. As a person who never eats on board nor drinks, except water, I forgot how people misuse the free alcoholic beverages. Back to the food. The chicken was succulent and most importantly boneless. That is the way airline food should be served. The mash and vegetables were a bit dry because there was not enough gravy. However, the vegetables did have a bit of crunch. I made an effort to taste it and the mashed potatoes was real potato and not the powdered kind. For Business Class, I peeked and saw them eating Roti with chicken curry. Roti is much like chappati but is made of white flour. This still looked nice. I ate my dessert though, but one thing I found missing was my cheese and crackers. I always loved that piece of cheese and crackers. A while ago they even used to serve you a piece of chocolate. For our trip back from Fiji, we flew out in the morning and was served breakfast. This consisted of an omelet, a hash brown, a sausage and this hideous tomato sauce with corn. I did not understand the concept of the corn but I took a taste of everything and it was fine. Once again, food that was suitable to be microwaved without spoiling its appearance. There was fruit salad, something I was craving for that morning, and an orange juice and a breadroll. It was not too bad at all. I prayed they would not serve us flattened croissants like they used to before. 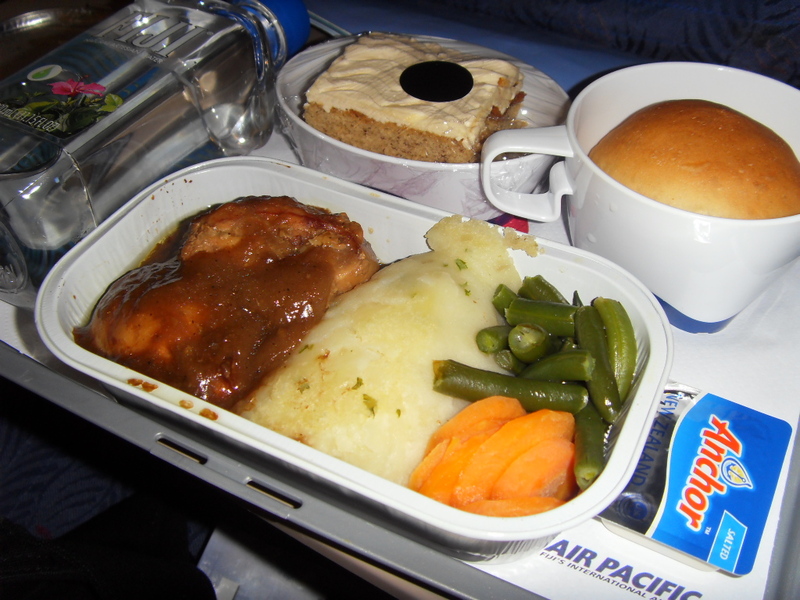 Perhaps this is the difference between Airline Caterers and outsourcing the food from different outlets. Now back to first class food. You see the smiling faces of the passengers along with the smiling face of the chef on board. Well I have not had this treatment, hopefully one day and I would surely like to see the chef smiling when he cooks before me with me telling him I want things done this way and that. Finally us folks at Cattle Class, we should stand up for better food. I am sure some of us can afford to have the online chef prepare the food for us even if we are in Cattle Class. We can pay him on board. What do you think? And those who read this and have photos of their aeroplane foods, please send it to me at my email. We can have more photos and also include the airline. Let them know our dismay. This entry was posted in Airline Food, Restaurant and Food Reviews and tagged Air Asia On Board Food, Air Pacific On Board Food, Cattle Class Food, Chef Nicholas Pillai, Nicholas Pillai, On Board Chef. Bookmark the permalink. I seldom eat on the plane, but I have notice the sudden drop in quality. Once Aeroplane food was something I used to look forward to, but now as they seem to want to cut corners, it’s not the same. The trend now is to offer more low cost flight, you can only imagine where they gonna cut cost to stay afloat. So, its not a suprise that the standard has drop.. It was a mildly burnt hotdog that was so shriveled with a very dry and dehydrated bun. Lord have mercy! its called the standard hotdog. even so, hotdogs are not served this way….one would think one was being being punished and served such food! I just felt that if one does not book food online, they are then served prison food… will send you the pix via email. It is just shocking how they treat us once we are up there I tell you. I never buy anything unless it is a cup of milo and that too if I really need it. It is not the cost but it is the quality. If you go to Australia and fly the internal flight you just lok at the quality of the food and cookies they sell on board.